Learn how to add or check power steering fluid on Mazda 5. This guide applies to Mazda 5 made during these years: 2010 2011 2012 2013 2014 2015 2016 2017 2018. If the power steering fluid is low on your Mazda5 make sure to add power steering fluid as soon as possible to avoid damage to the power steering pump. When the power steering level is low on your Mazda 5 you will notice some or all of the following symptoms. 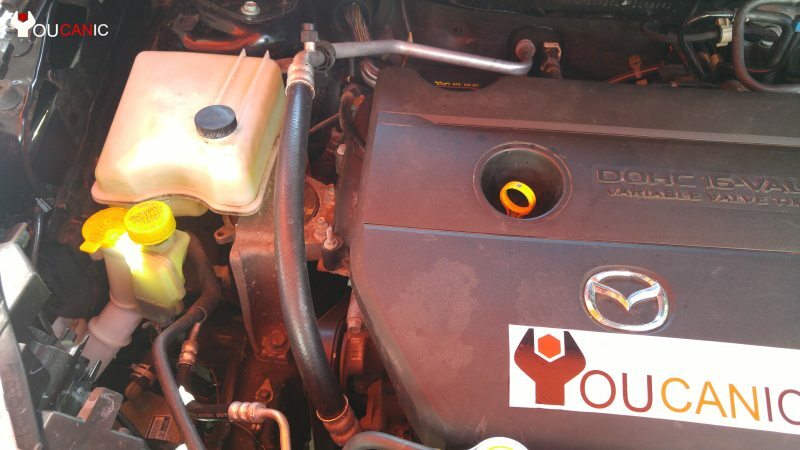 Follow these step-by-step instructions and watch the videos in this guide to learn how to add power steering fluid on a Mazda5. Locate the hood release underneath the dash. Pull the lever until you hear the hood pop open. Next, you need to release the hood safety latch at the front of the hood. Next, you need to locate the power steering pump on your Mazda 5 In this case, the power steering pump is located on the driver/passenger side of the engine bay. Once you find the power steering reservoir on your Mazda 5, remove the cap. Inspect current condition of the power steering fluid. If you look carefully on the side of the power steering reservoir, you will notice a Low and Max level for the power steering fluid. Determine if the current power steering level is below the minimum level. Adding power steering fluid on 2010-2018 Mazda 5 is very easy. Add power steering fluid to your car if the level is low. Checking the power steering fluid on a 2010-2018 Mazda 5 is easy and takes less than five minutes. Do not drive your Mazda 5 for an extended period if the power steering fluid level is low. Maza recommends that you use Mazda ATF M-III or Dexron II. If your power steering fluid level keeps dropping within a few days or even weeks, you may leak in the system and need to diagnose or repair your power steering system immediately.